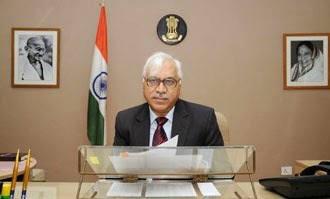 Dr. Shahabuddin Yaqoob Quraishi is an Indian Administrative Services officer, a former Indian Chief Election Commissioner, and a former Secretary in the Ministry of Youth Affairs and Sports. A graduate of Stephen's College in Delhi, and a Ph.D. holder in Communications and Social marketing. He currently teaches as Honorary Professor at Cluster Innovation Centre, University of Delhi. Dr. Quraishi is known for his special contributions in social sector reforms covering health, education, population, drug abuse, and civil society action. He has done extensive work in the fields of Gender, Women & Child Development, HIV/AIDS, Youth and Adolescent issues. UN and other international organizations have availed his expertise in these areas as consultant and resource person on several occasions. He also pioneered India’s biggest AIDS awareness programme and IEC campaign called ‘Universities Talk AIDS’ (UTA) in 159 Universities, considered as one of the best global practices. Dr. Quraishi has a number of books, articles and talks to his credit on issues related to democracy, elections, HIV AIDS and family planning, social marketing, women and child development and Youth. His book ‘Social Marketing for Social Change’ has broken new ground in the field of development communication. His recent book ‘An Undocumented Wonder: The Making of the Great Indian Election’ is the story of how the world's largest democracy holds its elections and is one of the highest selling books of the summer.